Everyone knows that exercise is one of those essentials that we must do for our health. However, it just so happens that most people also complain that they despise going to the gym or other workout center. So, how can you get the benefit of the exercise without the hassle, annoyance or inconvenience of driving to the gym? One answer is to get yourself a trampoline. Yes, just like what you had as a kid. Trampolines offer a huge variety of activities and games that you can do to help you burn some calories and actually enjoy it. If you haven’t been on one in a while, it may be kind of a scary proposition for you. If you have small kids, then you know the fun they’re having. There are all sorts of games like ‘popcorn’, crack the egg and trampoline basketball are just a few of the more popular ones. You may not be in for some of these games, but even simply jumping up and down will get your heart pumping. If you are not comfortable or safe doing this sort of exercise then, by all means, stay on the ground and stick to some basics, like walking or jogging. Balance is another component that will help you to steer clear of injury on a trampoline. On a larger one, like an 8 foot trampoline, it is really possible to get fairly high up. If you get off balance, you can land pretty hard on the side or even off of it on the ground if you’re not careful. While it may be funny on those home video shows, it isn’t funny when it happens to you. There are also those trampoline enclosures that can help with this issue. If you’d like something a bit more manageable, look into the mini-trampoline or rebounder. This is just a small built-for-one style that can be used indoors. This way, you can bounce along while watching television or some other show. 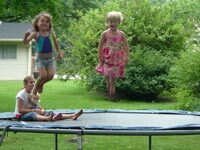 There is still the possibility of injury, so using a smaller trampoline should be done safely as well. Enjoy your new found exercise partner!